As anyone who has taken a basic college American literature course probably knows, one of the elements which always set the plays of Arthur Miller apart from those of his contemporaries is the connection of American male archetypes to the standard structure of Greek tragedy. Most especially, this involves the concept of the “fatal flaw” – the essential character glitch which leads a man down a path of destruction, entirely due to his own actions or understandings. Now the intense New Vic production of one of Miller’s greatest works, “A View from the Bridge” has arrived at the Ahmanson straight from New York, where it won a host of honors, including two Tony Awards. As a production it is stunning: contained (both literally and figuratively), visceral and achingly tragic. Given the current political climate, it also proves disturbingly timely for a piece written in the mid-1950s. The tale concerns life in an Italian-American neighborhood near the Brooklyn Bridge, one closely associated with the dockworkers at New York Harbor. Based on an actual tale told to Miller by a longshoreman, it concerns Eddie, who has developed an obsessive love for Catherine, the orphaned niece he has helped to raise. When his wife Beatrice arranges for two cousins to enter the country illegally from Italy, and Catherine falls in love with one of them, Eddie’s possessiveness explodes. One of the things which sets this work apart from other Miller works is the use of a sort of chorus, or narrator. He appears in the form of Alfieri, the lawyer who grew up in the same neighborhood and now provides what legal help he can for those who run afoul of local law, immigration or other elements of this insular community. This addition is at once both clarifying and disturbing. Director Ivo Van Hove has created a sense of watching a man in a cage of his own making, utilizing Jan Versweyveld’s box-like cube of a set to define the limitations of both Eddie’s understanding and ability to exercise the control he feels is necessary to his manhood. As a result, we as an audience are as much voyeurs as Alfieri is, watching a possibly preventable tragedy happen without being able to do anything about it. Frederick Weller leads the cast as Eddie, played as a man constantly wound tight by his need for control. His whole body often seems to sock the air he walks through, as if to underscore his sense of manliness. This, contrasted with the two cousins hiding in his home. Alex Esola’s Marco, a passionate and terrified family man arrived in the US to make money on the docks for his starving family at home, still operates with the ease of a man comfortable in his own physicality. Dave Register’s gentle Rodolpho moves with the lightheartedness of a man in love with life and the promise of a new country. Their intimidation factor, for Eddie, is thus as much a matter of muscle ease and tension as it is of plot. As Catherine, Catherine Combs creates a girl at once childlike and womanly – still greeting the father-figure she sees in Eddie with a kind of girlish abandon, and yet smitten by Rodolpho’s enthusiasm for life. Andrus Nichols’ Beatrice balances emotional fatigue, innate jealousy and observational disquiet as she watches the dangerous dance the rest of the cast engages in. All this is bound together by the contextual narration of Thomas Jay Ryan’s almost flaccid Alfieri – a man with knowledge, but no power over anything the play contains, and a lawyer’s understated admiration for the straightforward seething which provides the story’s foundation. Through all of it are Miller’s searing words which pound in the individual struggles: the tension between family loyalty and rigid neighborhood codes of conduct, Eddie’s desperate need to justify his growing hatred of Rodolpho by suggesting his lack of manly qualities, the struggle of Catherine to be seen as a woman, and of Beatrice to be seen as a wife. And always Marco, moving in quiet desperation as his children starve back home. In short, this is a very good production of a very good, if disturbing play. Van Hove’s choreographic direction creates an elemental rhythm which gives the production its heartbeat. The use of a classic requiem as background underscores the feel of watching the death of an entire world in small. And each member of this polished and gut-wrenching ensemble gets all one can from the characters one can’t take one’s eyes off of, like watching a spectacular car crash. Miller is always worth watching. This production is up to the mastery of the words. When a play becomes a classic, the underlying message is timelessness. Somehow, the work has created characters which transcend their own age, and delivers a message with an innate universality. Most certainly this is true of the best works of Arthur Miller, often termed America’s premiere playwright. 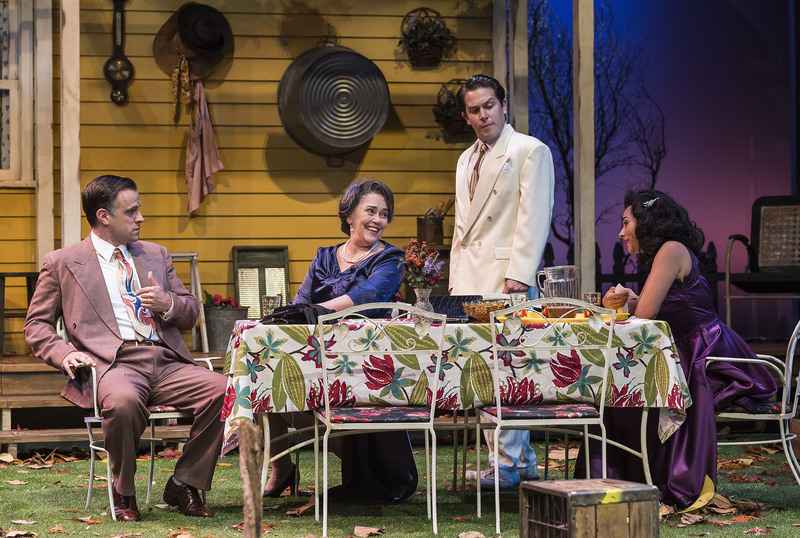 As if one needed proof, the solid rendition of his breakthrough work “All My Sons” at A Noise Within in Pasadena offers up that particular balance of the timely and the timeless, with a moral struggle as true today as it was in the years after World War II. The story wrestles with profiteering during that war, but it provides a window on modern wrestles between the corporation and the idealist, and between morality and mammon. As many know, it centers on a small, midwestern town and the two families at the center of its greatest controversy. During the war, the company owned by Joe Keller and his partner and neighbor Steve Deever made cylinder heads for aircraft. One day some came out cracked, but this was disguised and the cylinder heads were delivered anyway, leading to the deaths of 21 pilots. Both men went to jail for the coverup, but Keller has since been released on appeal. Deever is still in prison. Now, in the post-war era, Keller’s younger son Chris, a former army officer who lived through heated battles, helps run the business. He wants to become engaged to Deever’s daughter, Ann, though his mother Kate insists that this is impossible. Ann was Chris’ elder brother’s girl before the war, and though he and his plane went missing, Kate insists he’s going to return. Between Kate’s fervent belief, Chris’ intense belief that the only way his war experience can mean anything is if the world is better for what he and his men went through, and the hovering suspicions of Joe’s complicity in those pilot’s deaths, tension hovers ever near. Then news arrives which brings the tensions between truth and hope, between practical capitalism and idealism into sharp and painful focus. Director Geoff Elliott has made a few interesting choices in this production. Though the costumes (Leah Piehl) and setting place this very firmly in the 1947 in which it was first performed, the casting – far more diverse than a midwestern neighborhood of that era would have seen – seeks for universality. Also, the director has cast himself as Joe Keller, the focal point of much of the play’s drama. This is a bit disappointing, as an independent eye would have challenged him – as has been true in some other fairly recent ANW productions – to do his most creative interior work. Here he sometimes reverts to what one can recognize as a more formulaic approach for his own part. The same is not true for the rest of the cast, however, all of whom prove strong and compelling. Rafael Goldstein steps into Chris’ passion and belief system as if it was made for him. The events which begin to rock Chris’ understandings seem to hit on a visceral level, making the character rounded and deeply believable. Maegan McConnell gives Ann the balance of trust and nerve and direction, and the chemistry between her and Goldstein center the conundrums of this young couple’s desire to move forward. Most profoundly, Deborah Strang’s aching, obsessive Kate has a naturalness about her maternalism which anchors the entire proceeding. Also worthy of considerable note are Aaron Blakely, briefly but intensely present as Ann’s furious brother almost wooed back into the neighborhood fold, E.K. Dagenfield and Natalie Reiko as a young couple unusually untouched by the chaos of war which surrounded most of their contemporaries, and Vega Pierce-English as the neighbor boy urged to virtuousness by the the comparatively questionable Joe. Perhaps most captivating is the underscore to the entire debate over money’s role in both happiness and morality exemplified by Jeremy Rabb’s country doctor dreaming of a life in research and June Carryl as his wife, insistent he live out his promise of financial security instead. There is a reason students still study “All My Sons,” as its ethical dilemma seems as fresh today as ever. Joe’s insistence that money and leaving something for his son to inherit trumps anything else, contrasted to his son’s insistence on seeing the world beyond the factory door – that age-old battle between the market and humanity – could be reset in any time frame from the Civil War to this year’s presidential campaign. The art of Miller is to bring it down to the extremely personal, to people you believe you know. That, and the solidly interesting performances from most of the cast, make this definitely worth watching. 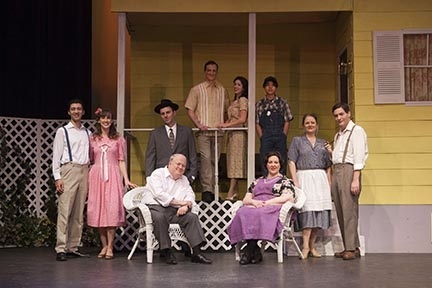 “All My Sons” is part of ANW’s three-play fall repertory season, alternating with “A Flea in Her Ear” and “Antigone”. 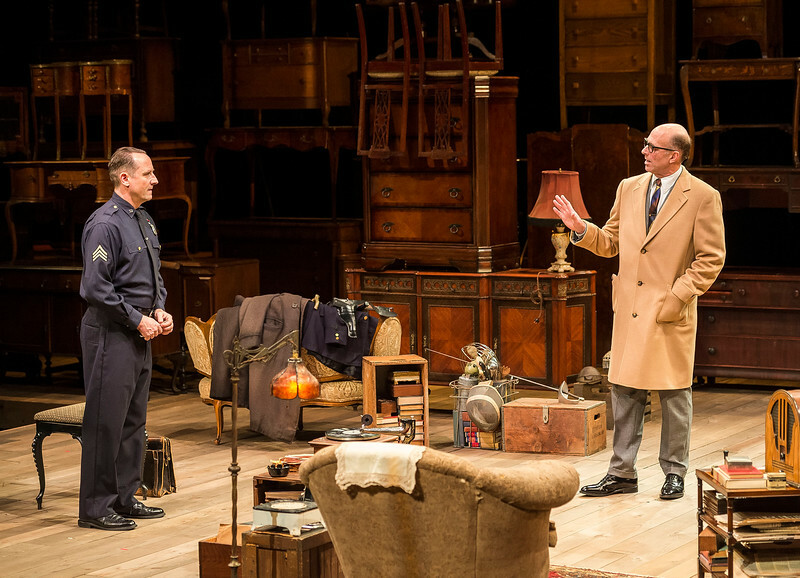 It depends on what matters to you in a theatrical production as to whether Arthur Miller’s “The Price” at the Mark Taper Forum will meet or disappoint your expectations. If you enjoy watching peak-quality actors create and run around in characters created by one of the rarest talents of the 20th century, you’re in for a treat. If you’re looking for greatness in the script itself, well, there is a reason “The Price” isn’t the play which trips off the tongue at mention of Miller’s name. The tale has two vastly differing segments, divided by an intermission. Both take place in the apartment of a once-influential, rich man who lost everything in the stock market crash of 1929. Now, in the mid-sixties, he has died, his whole apartment building is due to be razed, and his sons – one the disappointed career cop who helped to support him, the other a successful surgeon who left him behind – must either take or sell what remains of his household goods. The first segment is high on a kind of practical comedy, as Walter, the cop, must joust both with is frustrated wife and with the clever, if ancient Gregory Solomon – the furniture appraiser he has called to bid on the apartment’s contents. The second opens raw wounds, as the surgeon, Victor, appears radiating a sense of command and of the rightness of his more youthful actions. Through it all, Walter’s wife underscores the importance of money in all of this, and in her evaluation of them both. The true star of the Taper production is Alan Mandell, whose Solomon radiates with the practical combination of earnest wisdom and manipulative coercion which makes for a good salesman. He makes the comedy this character represents organic to the play, a seamlessness far harder than it looks. John Bedford Lloyd gives Walter the earnest solidity one expects from a lifelong cop and the seething resentment of a man who feels forced to abandon his own dreams by those who would not abandon theirs. Sam Robards’ Victor embodies the confidence of a man broken by his own success, yet still radiating with an inner focus which makes him appear unbending even as he reaches out. 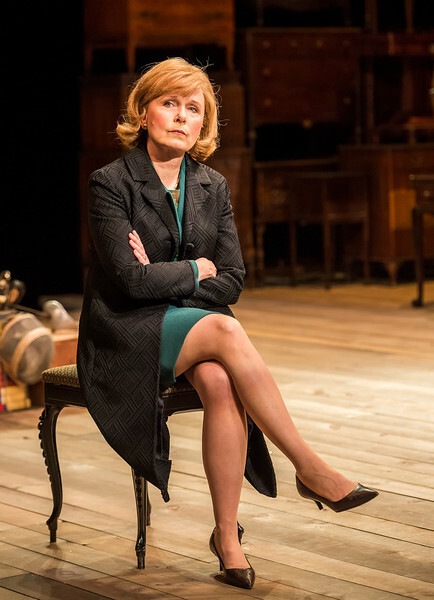 Kate Burton, as the disappointed Esther, makes her a dreamer with practical roots, trying hard to find meaning in a life she did not choose. Matt Saunders’ surreal yet fascinating set design allows the stage area to shrink into a tiny space where all the characters collide not only with themselves but with the dead father whose innate presence and actions are the elephant in the room. Director Garry Hynes acts as choreographer, moving characters in and out of center focus with the precision of a gavotte, and keeping the whole thing both earnest and to some extent underplayed – a great way to feel the tensions rise. Still, “The Price” as a play has its flaws, seeming almost two one-acts kind of sewn together. Even so, the performances are so strong they become worth the adventure all by themselves. In particular, a chance to catch Mandell is particularly worth the trip. 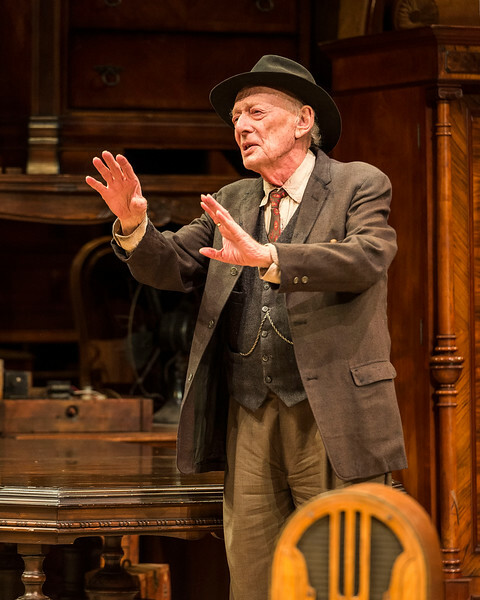 Last seen at the Taper in “Waiting for Godot,” in a part he originated for Samuel Beckett, he is a remarkable talent proven over an 80-year acting career. For many, both in theatrical and literary circles, Arthur Miller stands out as the greatest American playwright of the 20th Century. His plays used classical forms and modern references to examine universal themes of contemporary morality, from the empty ideals of a Willie Loman, the rushes to judgement represented by the Salem Witch Trials, or the choices of the powerless in Nazi Germany. In one of his first, and most powerful plays, “All My Sons” the battle – still very present today – between free enterprise and ethical responsibility wrenches apart that most sacred of American icons, the nuclear family. In a new production at Whittier Community Theatre, much of the power of this classic play is on display. The direction is intelligent and the pacing keeps the passions moving. Most of the actors are up to the task. It all adds up to a fairly pleasant revisit with this great work. We are at the home of Joe Keller, a small town Midwestern manufacturer who both made and marred his fortunes during World War II – a war in which his elder son died. He was imprisoned along with his business partner for selling defective parts to the Air Corps, resulting in the deaths of pilots. He was freed, his partner is still jailed, his boy is dead, and his second son appears to be romancing his partner’s daughter. Worst, his wife will not give up the idea that some day their older son will return. Richard Large slides easily into the character of Joe, full of a friendly, but overly hearty bluster. As his troubled wife, Kate, Candy Beck hits just the right balance between motherliness and deep, abiding sadness. Justin Patrick Murphy shines as the stalwart and straightforward Chris, the younger brother – a seeker in his own right, torn between his parents’ legacy and his love for his girl. As the equally torn love interest, Ann, Alexandra Ozeri moves with the appropriate combination of nervousness and excitement. Unfortunately, her understanding of vocal projection leads her to make her voice very shrill. This makes her a bit less sympathetic and a bit harder to listen to as the show progresses. Norman Dostal makes a brief but vibratingly emotional appearance as Ann’s lawyer brother, fresh from a visit to their imprisoned father. Todd Rew has several very telling moments as the young and idealistic doctor. Shannon Fuller balances him well as his extremely practical, moderately bitter wife. Ernie Rivera and Casey Morlet have fun as the somewhat blissful and innocent young couple down the street, while John Noah Molina supplies the neighborhood kid Joe encourages to be law-abiding to a fault. Director Roxanne Barker has a real feel for this kind of material. She keeps the pace flowing and gives the characters enough to do to keep the whole thing from devolving into a debate. The set, by Suzanne Frederickson, evokes the kind of Midwestern yard and house which create the normalcy in this disquieting tale. Karen Jacobson handles the props and costumes, and opts either for the vaguely or specifically period, though one wonders why almost all the men’s pants are a bit short. Still, this is a lively production – particularly polished for a community group. The group itself is worth mentioning. As they barrel through their 91st season they are probably the oldest continuously operating theatrical company in the greater Los Angeles area. That’s worthy of note, all by itself. 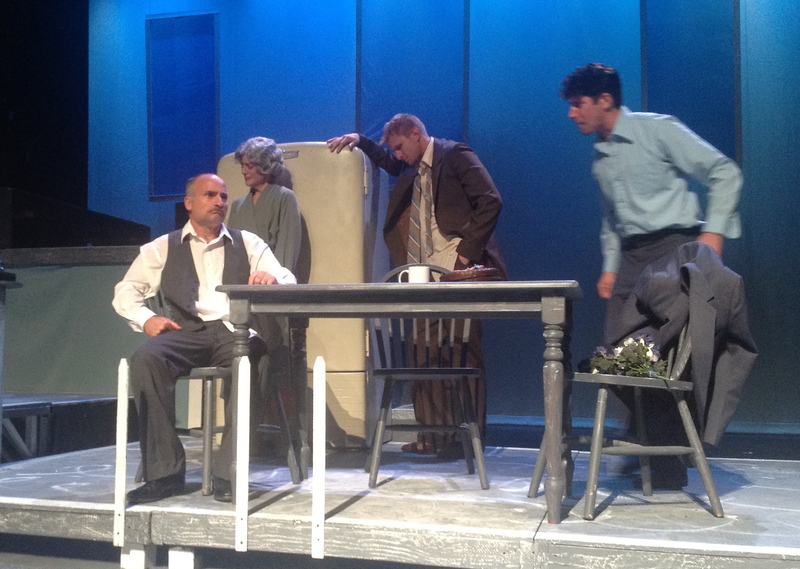 Jody St. Michael, Chad Goodwin and Shawn Vena are Willy Loman and his sons in the Covina Center’s “Death of a Salesman”. Arguably, the greatest play written by an American in the 20th century is Arthur Miller’s “Death of a Salesman.” Studied in public schools all over the nation, it is a modern tragedy constructed using the rules established by the ancient Greeks, yet seems at the same time an elemental tale of American machismo. The gradual unraveling of Willy Loman has become absolutely iconic as the reverse side of the American dream. Now a new, rather stylized production of this great work is on the boards at the Covina Center for the Performing Arts. Director Steve Julian has made some interesting choices, some of which create a fluid tale, some of which are a bit more questionable. In the end, the production doesn’t always come through, but isn’t awful either. A disturbingly telling moment comes even before the play begins, when Julian comes on the P.A. system to explain the show to the audience. Is this an assumption that the audience can’t “get” the play (which includes flashbacks) without help? Certainly a play commonly read by high school students can’t be that tough. The play then starts with an interesting, shadow-like animation – a portrait of defeat. It never reappears. Neither does any other symbolic or animated enhancement, leaving that first impression (and it is the very first thing you see) as an odd outlier. The intensity of the production proves important, and a lot of the success of any production of “Death of a Salesman” hangs squarely on the shoulders of the man playing Willy. In this case, Jody St. Michael makes an interesting work of the part. Physically, he is far more diminutive than those who have often played Willy, but that can work – actually makes a lot of sense, played the way St. Michael sees him. Unfortunately, he starts the evening already vibratingly anxious and stutteringly depressive, leaving Willy no place to go. The growth toward abject despair proves elemental to the play. Here it cannot happen. Supporting St. Michael, Jill Gerber makes Willy’s wife a woman gentle wisdom, who sees the train wreck coming even as she remains unheard on any deep level by the others in her world. Shawn Vena plays Willy’s jock son rather all in one key, his deflation somewhat harder to believe than his teenaged bravado. Chad Goodwin makes really excellent work of the younger, often ignored son. His move toward instant gratification makes as much sense as in any version I have seen. These folks are backed by a solid cast. Standouts include Mike Johnson as Willy’s good-hearted neighbor, Andrew Batiz, particularly effective as the neighbor’s once-nerdy and now successful son, and Candida Orosco as the woman who changes not only Willy’s world but his son’s as well. Maureen Weiss has designed a stark, angular and bare-bones set which works well in this equally stark tale, allowing the pacing to move forward without interruption for time or place shifts. Linda Vick has found evocatively 50s costumes, though all the ties are very 70s. In short, “Death of a Salesman” is inarguably a great play. At Covina one can see it on its feet – something comparatively rare. Still, one wonders what would have happened if the director had both trusted his audience, and completed the interesting symbolic vision he began. As it is, with Willy played mostly in one key and an underlying atmosphere of “here – I’ve made this obvious for you,” it seems to miss some of what the play actually had to say. Playwright Arthur Miller tends toward one elemental theme in his work. In “Death of a Salesman,” considered by many to be the greatest play written by an American, in his other major works like “All My Sons”, and in less well known pieces like “Incident at Vichy” the question is always about personal ethical choices, and the results they engender. 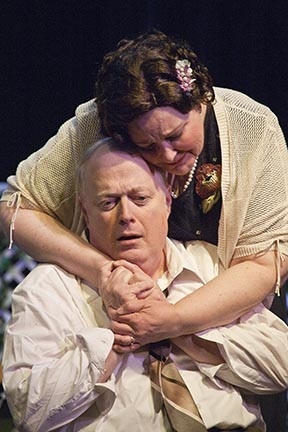 Now, at Sierra Madre Playhouse, a strong cast brings “Incident at Vichy” to vibrant life. The questions the play asks are singularly evocative in our own day, when everyone from businessmen to politicians dance to the pipings of power. In this examination of how Nazism managed its control, the acceptance of horror, the sense of powerlessness, and the balance of self-preservation and ethical rightness make for intense watching. It is Vichy, France in 1942. The new capital of France’s puppet government under the Nazis, it is just beginning to see the effects of German racial attitudes which have already poisoned most of the rest of Europe. In a holding cell, a collection of (mostly) men somewhat randomly snatched off the streets waits each one’s turn for an inspection of identity papers. It quickly becomes obvious that those who are Jewish will face a fate far different from those who are not. What then, is the responsibility of the doomed, if they are doomed? What is the responsibility of someone who is not Jewish and may be able to walk away? And what of the captors themselves – some German, some French? In what sense may they be caught in a web as well? What moral forces will define these people? Is there even a place for morality in this jaw-droppingly inhumane, yet bureaucratic quagmire? To make this long one-act play work, every single person, from ones who appear briefly to those who stay on stage for the entire hour and a half, must be create a strongly individual character. This often proves an overwhelming demand for small, comparatively community-oriented theaters where the smallest parts are often handed to the best friend of the ticket taker, or someone’s available spouse – anyone who can walk on, say a line, and walk off without tripping or giggling. Not this time. From the guard who appears for mere moments to the elderly Austrian prince whose presence helps define the action from the first line to the last, each actor does a splendid job. Of particular note are Davind Kieran, underplayed and thoughtful as the aforementioned prince, whose quick categorization of Nazis as uncivilized thugs unravels as the play proceeds, and Rick Knolla as the psychiatrist trying to analyze a larger framework for the devastation sweeping him away. Barry Saltzman’s intensely nervous, fussy painter proves most effective, as does Colin Campbell’s well-known actor desperately clinging to the idea that civilized people will, in the end, only treat each other in civilized ways. Also excellent are Rendon Ramsey, as a socialist railroad electrician balancing fear and pride, Andy Harris as a rather fatalistic young boy, Zayd Jaber as a waiter startled to discover his captor is a favorite customer, and John Dimitri, briefly but recognizably pompous as a collaborating businessman. In almost wordless but nonetheless powerful portraits, Rebecca Rodick becomes very memorable as an aging gypsy woman, while Vance Wells evokes gentle despair as an elderly Orthodox Jew reciting the Kaddish as he awaits his doom. As the German and French captors, Karyn O’Bryant’s “anthropological expert” vibrates with the certainty of a devout Nazi, while Matt Dodge, playing a German army major assigned to run this operation (but only until the SS arrives – he is a field officer, after all) becomes a portrait of a man subjugating personal beliefs to pride and a sense of inevitability. Brent Schindele, as the French captain glad to hand responsibility to others, and Aaron Jackson as the obsequious local cafe owner startled to discover his waiter among the detainees finish out the cast. Because these individual portraits are all so clearly drawn by both the script and the cast, the arguments of the play become central. Director Barbara Schofield keeps the rhythm taut and naturalistic, and creates a great deal of realistic movement around a static space. Thus, what could have devolved into a costumed ethical discussion remains vibrant, thoughtful theater. 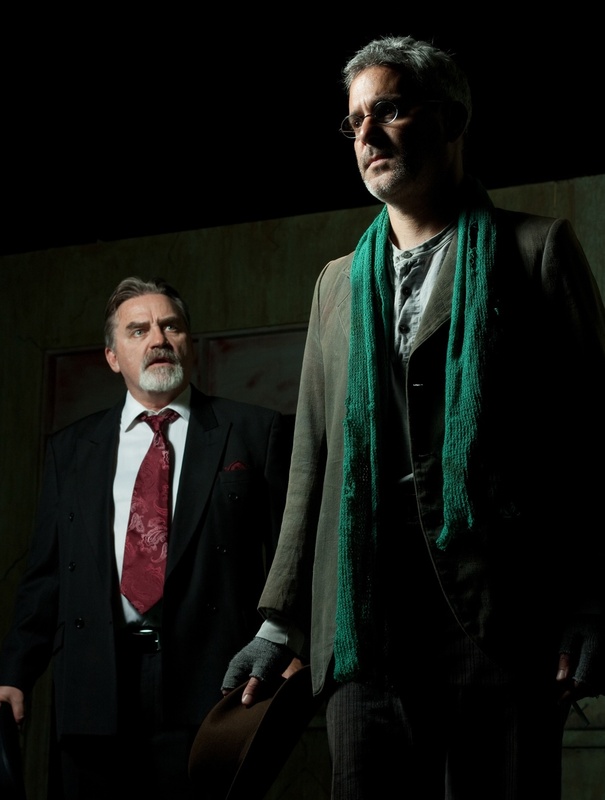 Nods also to set designer Don Bergmann, who along with Schofield has created a bleak, yet layered space which underscores the desperation while still allowing for adequate movement, and the sense of the unknown in that “next room,” so important to the play’s tension. “Incident at Vichy” is powerful stuff, and though the ideals expressed are not unique to Miller, told with his flair for precision and heart the play leaves much for those who see it to chew over. When this piece originally opened on Broadway in 1964, it lasted for only 32 performances. Perhaps at that time people were too close to all the messages the individual characters have to share about individualism, about sense of powerlessness against oppression, even about the ability of Nazis to be otherwise nice people. Today it brings those messages to those who potentially share a different sense of the world, who may be ready to hear what Miller has been saying all along about the power of personal choice, even when all seems lost.